Let us bring this special training to you… $25/person includes a hard copy of the workbook. 12 – 15 persons is optimal. Robert Lon Barber, LSCSW — Emeritus/Author & Illustrator of Lu Lu, The Blue Flamingo – Greatly appreciated the training on How To Use LinkedIn by Zen! While I am a novice to formalized networking and social media techniques & tools… I found Zen’s easy going and humorous approach much akin to Gene Wilder meeting Siddhartha & Lao Tzu very refreshing as opposed to a stiff, boring and info-only meeting. Based on what I experienced, I recommend that you consult with him! Carmen Payne – Owner, SOAR! Transformational Life Coaching – Just attended Zen’s LinkedIn class. I found it informative and it definitely expanded my LinkedIn knowledge and what actions I can take to improve my impact on LinkedIn. Thank you Zen! Lisa Mead – Certified High Performance Coach – Attended a LinkedIn class with Zen facilitating the group. I learned steps to take to improve my experience with LinkedIn for personal and professional loves. Zen has easy to use tips and is very helpful with a relaxed training style. 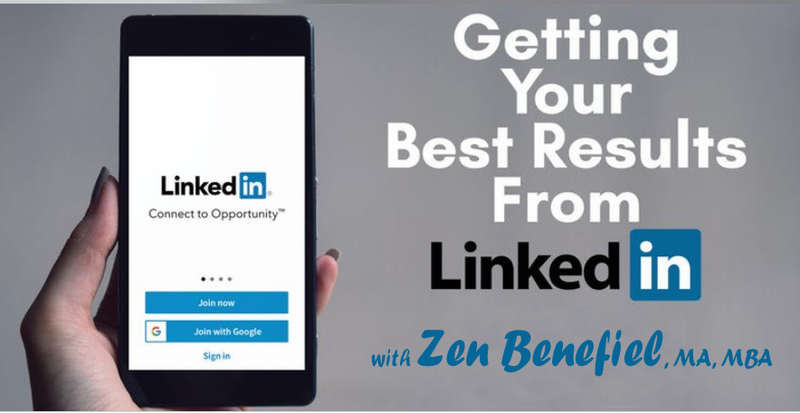 Sharon Eisner – Wealth Creation, Time Freedom, Global International Business – I have recently taken a course by Zen Benefiel on how to use LinkedIn and I would highly recommend him. He teaches in a way that is easy to understand and will walk you through all of his exercises, making sure that you have acquired your new skills. Cristina Coash – Account Executive at Coash & Coash – Thank you Zen for making the LinkedIn workshop a very pleasant and easy to follow experience. I found that your knowledge of the subject partnered with your ease of teaching allowed me have a better understanding of how better to use LinkedIn. 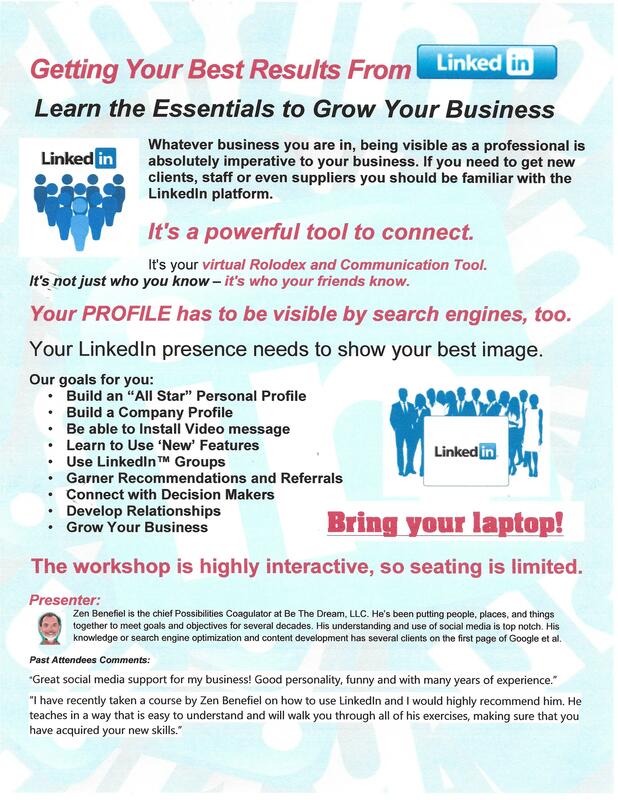 Robert Miksovsky – Independent Operator at Cruise Planners – Reliable Travel Planners, LLC – Zen presented a workshop on Linkedin, “Getting to Sales using Linkedin”. His presentation was wonderful. It was just the right speed, thorough, and hands-on. Powerpoint slides were useful and informational. Sherri Rowland – Graphic Designer, Fine Artist, Photo editor, Photographer – Zen’s Linkedin training workshop was interesting, informative and fun. Since it was a hands-on learning experience, we got to explore features in LinkedIn that I didn’t know existed! Great information for anyone looking to fully utilize the power of LinkedIn. 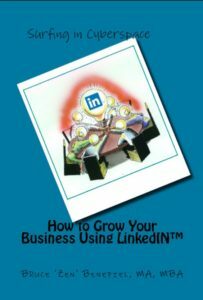 Gina W. Ore – Founder & CEO, Passion for Patients – I was pleased to attend the SCORE sponsored “Growing Your Business with LinkedIN” class that Zen facilitated. To say that the class was extremely helpful would be a gross understatement! Every issue and topic (some of these discussions went beyond LinkedIN) addressed during our 2-hour session were modern-day applicable without being so very techy which made it quite possible for those non-techs of us to understand. Additionally, the classroom and real life practice of the nuances of LinkedIn were very helpful as Zen encouraged classmates to assist each other as well. Zen’s refreshing and repeated attitude about on-line transparency was quite impressive – and he also offered personal insight re building a business. I would take his class again ! Patrick Ingram (Greater Phoenix Score, Director of Education) – Just attended Zen’s LinkedIn class. It was an excellent presentation and I walked away with the information that I needed to implement LinkedIn as a marketing tool. Wendy Csader – Contracts Manager at FITCH – Zen conducted a SCORE LinkedIn class which I recently attended. Zen was well-versed on the subject, and clearly communicated his knowledge of the material to a group with mixed experience levels. He was also quite patient with a multitude of interruptions and questions. I would not hesitate to attend another class conducted by Zen.